I am an ice cream girl. It is usually my sweet of choice. But I rarely keep ice cream at my house. I am not much of a cake girl....unless it is my birthday. I adore cupcakes...but only buy them occasionally if it is girl's night. And I have never been one to eat candy bars...UNTIL RECENTLY. It all started back at Easter...when we had an Egg Hunt with friends. Tommy bought some Milky Way Minis to fill our eggs. I found about 4 eggs that contained Mini's and over the course of a week...ate and enjoy my treat. 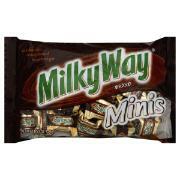 At the end of the week, I mentioned how much I LOVED Milky Way...who knew? And he told me that he still had the rest of the bad in the freezer. That bag lasted until close to the end of May....I had one mini every few days...and it was great. A little treat. Then he came in with 2 more bags...because they were on sale. I started popping one everyday. Then we were out of town a couple of weeks ago, and went into a target that had them clearanced down to $1.36. I started LOADING DOWN THE CART!!! I came to my senses and put back all but three bags. That night in the hotel I popped one after another into my mouth...I couldn't stop...and I haven't until yesterday. THIS IS WAR!!! NO MORE MILKY WAYS!!! Yesterday I managed an entire day without 1 piece...VICTORY! I threw what was left into the freezer...I don't like them frozen...but Tommy can still eat them. I am exactly the same way. There are certain foods (sweets mostly) that I can NOT have in the house because I just can't eat them sensibly. :/ Good luck! You can do it! NO MORE MILKY WAYS THIS WEEK! Good goal! I know what you mean about not being able to stop. Putting most of the bags back at the store must have been tough. I like to think that I deserve little treats every so often, but I go overboard when I buy in bulk. Good luck on your week-long detox! Over here a milky way is a small chocolate coated bar that has a whiped chocolate filling and they are yummy..........so what are your milky ways like? I do that with Mini Reeses Cups! Sometimes I talk myself into thinking I deserve just one, and then I eat half the bag! You can do this! I'm such a candy junkie--you have more willpower than me! Putting chocolate in the freezer doesn't help me at all, I love it frozen even more! I have the same problem with Nutella. I just can't stay out of it. It's the only thing that I no longer allow in my house. :) Good luck! You can do this!